The purpose of the Graduate Program Teaching Initiative (GPTI) was to enable doctoral programs to assess their preparation of Ph.D. and Th.D. students for teaching appointments. 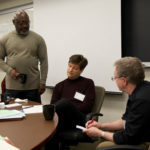 The assessment involved conversations with recent alumni/ae to explore the alignment between the preparation they received and the context in which they are currently teaching. 33 graduate programs were awarded $15,000 grants to host Teaching Initiative Gatherings at their school or at a site in close proximity. These gatherings involved 8-10 recent alumni/ae (graduated in the last 5 years and in a teaching appointment), the Dean of the School, Graduate Program Director, and 2-3 key faculty members. The Wabash Center provided each school with a consultant to help them design and lead the 2-day/1 night meeting and a Wabash Center staff person as an observer. The focus of the Teaching Initiative gathering was to explore questions of teaching preparedness with alumni/ae and key parties at the school.